EL50 Economic Digital IR Pyrometer. Highly Accurate Digital Pyrometer with Extended Sensor Head, Inbuilt LCD & Keypad for Parameterization. EL50 is provided with USB 2.0 output and PC software. 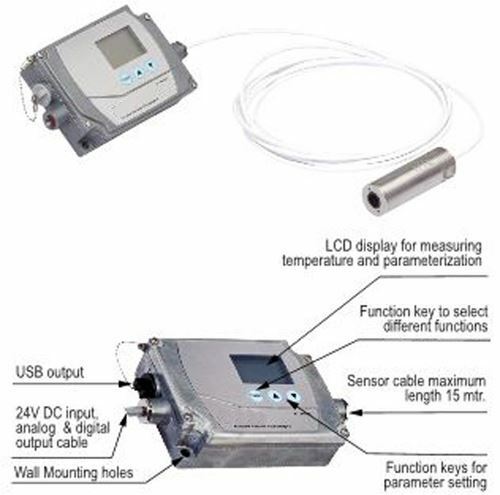 EL50 is an economic digital IR Pyrometer from E series with extended sensing head in 4 wire technology for non-contact temperature measurement between 0°C to 800°C.The sensor head is unaffected by electromagnetic interferences. The pyrometers are specially designed in a such way that sensor head can withstand ambient temperature upto 120°C easily.